Now that you've purchased your DEWALT product you can now redeem your free item in 5 easy steps. When did you purchase your DEWALT product? Terms & Conditions Apply. Proof of purchase is required. Q1 Promotional offers apply for purchases made during the Period of 1st February 2019 – 31st March 2019. Entries open online until 14 days after the promotional period ends for purchases during the promotional period. 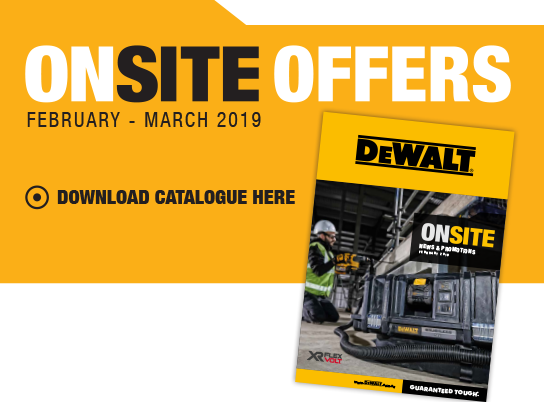 Redemption offers only available to individual consumers purchasing products directly from a DEWALT stockist in store or online. Promotion not available in conjunction with commercial tenders or bulk orders. Resellers are not eligible to claim on behalf of 3rd party customers.